The Lynxmotion Johnny 5 Robot Kit is a very cool and completely functional model of the ever popular movie robot. The kit is available as a full Johnny 5 combo kit, or just the torso and rotating base to be added to a different style base. 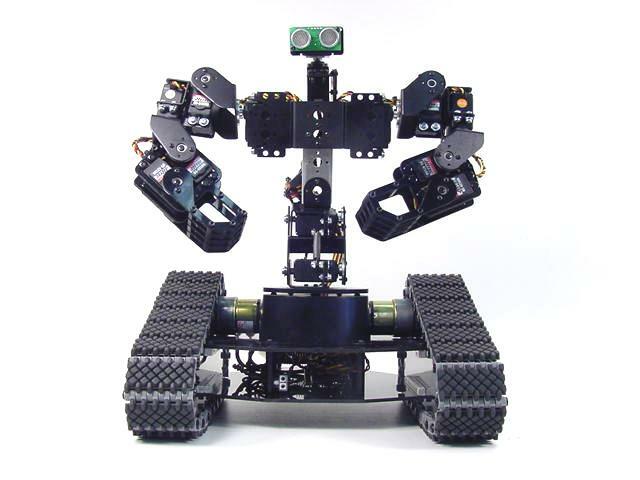 The robot is designed for indoor or outdoor use and performs well on many different surfaces. The robot is made from Servo Erector Set aluminum brackets, custom injection molded components, and ultra-tough laser-cut Lexan structural components. 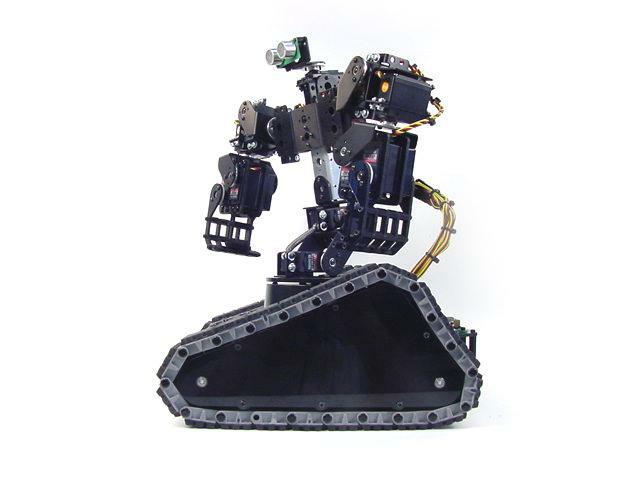 The torso is fully articulated utilizing 8 x HS-645MG, 3 x HS-475HB / HS-485HB, and 3 x HS-422 servos, and our SSC-32 servo controller. By utilizing heavy duty polypropylene and rubber tracks with durable ABS molded sprockets the robot has excellent traction. It includes two 12vdc 50:1 gear head motors and the Sabertooth 2 x 5 motor controller. The combo kit includes the powerful Lynxmotion Sequencer Program for PC. You can control the robot from a PC with the included DB9 cable, or use a SparkFun bluetooth modem for wireless PC control. Check out our Assembly Guides page for BlueSMiRF and SSC-32 Configuration Tutorials for specific information. The robot is compatible with the following batteries and chargers. To keep costs down we are not providing printed Assembly Guides. They are provided online, so you will need to print them when you order the kits. By providing the Assembly Guides online we can provide more detailed and up to date information than the old hardcopy method allowed. 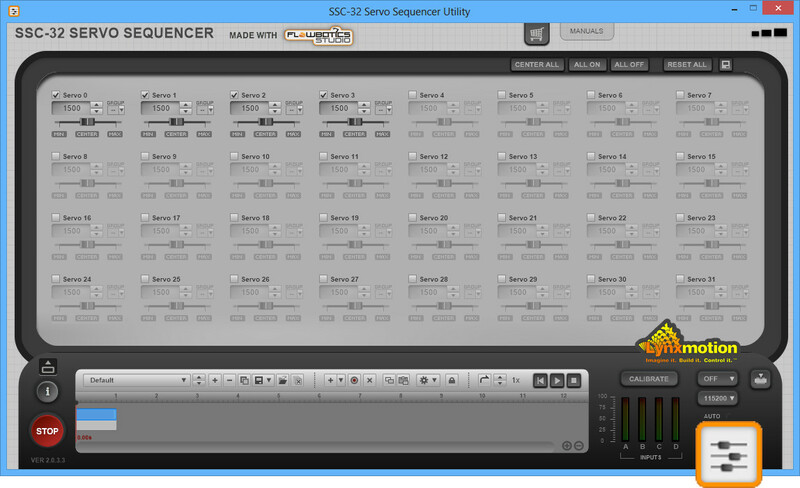 For kits which include the SSC-32 servo controller board, the new SSC-32 Servo Sequencer Utility is now available as a free downloadable utility which makes it easy to experiment with robotics and animatronics. This utility is an example of the type of program which can be built using FlowBotics Studio, which includes this program as an open source demo project. The SSC-32 Servo Sequencer Utility program enables you to easily move servo motors, calibrate their position, store and playback motion sequences, upgrade the SSC-32 firmware and more. This is the complete Johnny 5 combo kit. Note, batteries and "eyes" not included. This is the Johnny 5 torso and base kit. 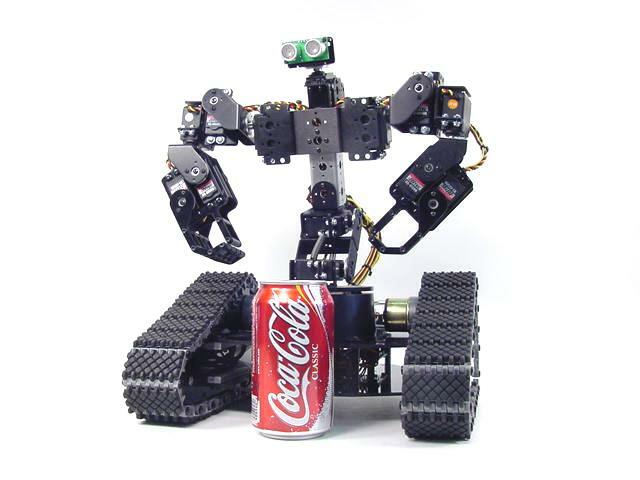 Add Johnny 5 onto your existing rover or tracked chassis! Note, Tri-Track Chassis kit, electronics, and "eyes" not included.